Does resurfacing work on fiberglass? The materials we use have an excellent adhesion to not only fiberglass, but also cast iron, ceramic tile, formica countertops, wood & metal cabinets, and more! What about grout lines when resurfacing ceramic tile? 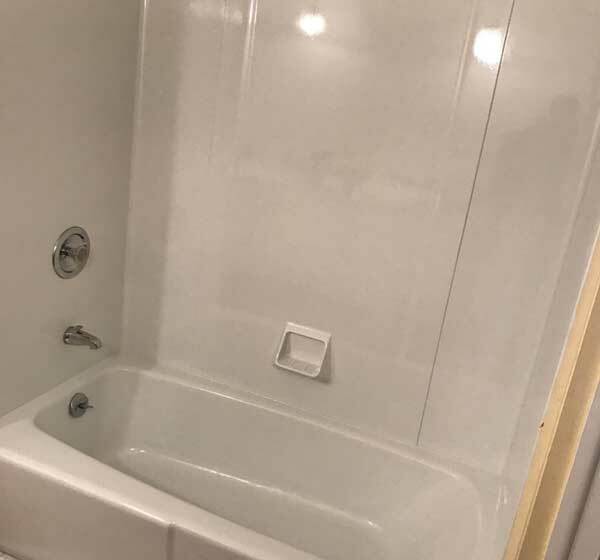 The finish is applied over the grout lines as well as the tile, thus becoming sealed and non-porous which means they won't collect the mold and mildew anymore while keeping the appearance of a tiled surface. But before the reglazing takes place, Jim regrouts all the tile which optimizes the appearance and structure of the refinished tile. What is involved with the resurfacing process? First, all existing caulking is removed. Then, all surfaces to be reglazed are cleaned with industrial strength cleaners. All chips are then filled and sanded. The area around the item to be resurfaced is covered with protective paper and tape. The room is properly ventilated using a powerful fan specifically designed for this purpose along with flexible tubing which snakes to the outside. 5 - 6 layers of coatings are applied beginning with an Adhesion Promoter followed by 2 layers of primer and 2 - 3 layers of acrylic urethane topcoat. Preparation is roughly 80% of the time and key to high quality results which is why the owner insists on doing every job himself so he can assure the highest level of quality to each and every customer. The area is clean and tidy upon completion of the work. What can be done for my cabinets? In addition to resurfacing bathtub, sinks, and countertops...kitchen and bathroom vanity cabinets can also be resurfaced while in place. We can give cabinets a professional look, with new handles and/or knobs, at a fraction of the cost of replacing or refacing. Our process is truly "resurfacing" rather than painting. We only use top-of-the-line product costing over $100 per gallon. Our material is sprayed on thus leaving no brush or roller marks. We can also custom mix any color. 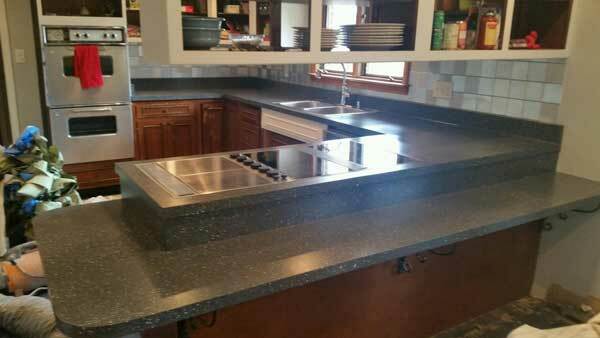 Do you install new countertops? No, but we can resurface your existing ones! We can do a solid color or a multi-color speckled/fleck pattern. The heat threshold on the materials we use is 550 degrees farenheit. Resurfacing leaves a finish that is about 95% as durable as the original finish. It holds up very nicely, but like your existing countertops, should not be used as a hotplate or cuttingboard. I have an older home with a clawfoot tub...can anything be done to it? Of course! 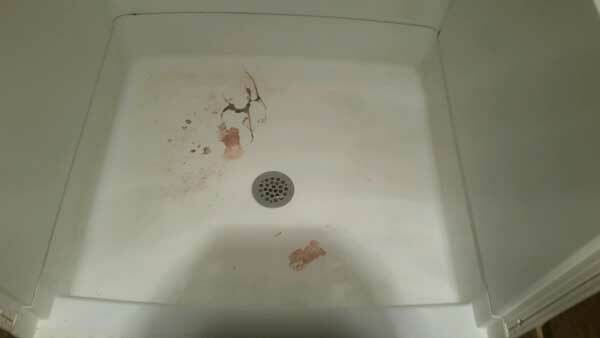 We resurface the inside of clawfoot tubs at your home for $495. Since ordinary bathroom paints can be used on the outside of the clawfoot tubs, our customers usually choose to paint the outside themselves in order to save money. Refinishing of the clawfoot tub is often done right there in the bathroom where it will be used. Nearly half of our work is done on commercial and rental property. We give the same 5 year warranty whether it's an individual homeowner, college student housing, or hotel. Is there an odor involved with the resurfacing process? There is indeed an odor which is similar to the odor you'd get from painting a room in your house. The ventilation we use during our process helps keep the odor to a minimum. How do I clean my resurfaced surface? We recommend a soft rag or a sponge along with a foam or gel cleaner. There are many available at the grocery store such as Scrubbing Bubbles or Lysol. Stay away from bristle pads and abrasive cleaners such as Comet and Ajax as they can dull the surface. Click on the question link above for more cleaning tips. What about chips and scratches? Whether it be brand new construction or other conditions, we can repair and resurface chips, scratches, and most holes. We accept cash, personal & business checks. We do not accept credit or debit cards at this time. Just give us a call at 815-756-2565 or toll free at 1-877-TILE-TUB. You can also click here and e-mail us at resurfacepros@aol.com. Is there a break for having multiple bathrooms worked on? What about a contractor´s deal? If you have more than one bathtub to be reglazed, call and ask about the Contractor´s Special. 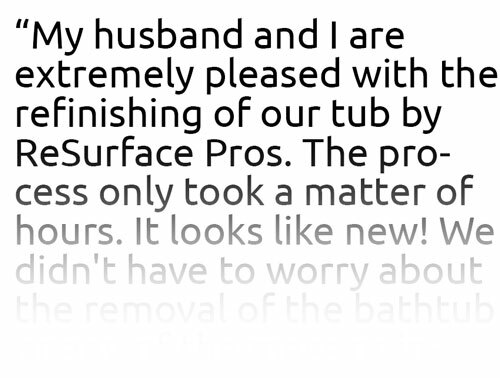 Do you refinish Jacuzzi tubs? Whirlpool tubs, Jacuzzis, Garden Tubs...they all can be transformed with little down time. Remember, we can go from any color, to any color. Can I see what this looks like in person? Call us for an appointment to see our tub, tile, cabinets or countertops. Toll Free 877–TILETUB. Yes, we use our home as our showroom. Visits are by appointment only. Please contact us for more information.